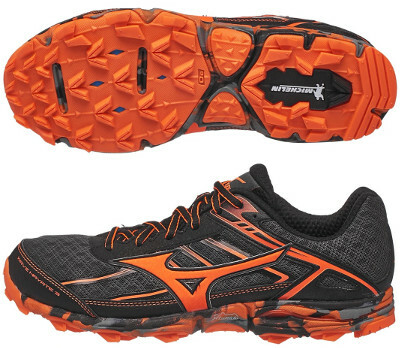 Mizuno Wave Hayate 3 are neutral trail running shoes. The all (but brand name) new Mizuno Wave Hayate 3 is the revamped trail shoe for racing offroad from the japanese brand. Despite 10% weight increase, the Wave Hayate 3 adapts better to uneven terrain because of improved flexibility and features enough reinforcements (although not as much as its bigger sibling Wave Mujin 4) to protect against sharp objects and debris. Hopefully Mizuno can get its distribution policy to retail right and tag it with attractive price to make the Wave Hayate 3 a bestseller within its category. There are many changes compared to its predecessor Wave Hayate 2 and at first look it seems more consistent, durable enough to go through tricky terrain and featuring a modern and ferocious design promoting faster running. As mentioned above breathable but rugged mesh is completely new and includes several sewed reinforcements to protect from external objects. Unfortunately there is no Gore-Tex™ edition available for complicated weather conditions. Midsole construction is the typical one among other Mizuno trail models based on reliable AP+ (no U4ic or U4icX available yet) and concave Wave™ in rearfoot for efficient and firm cushioning. What is new in current edition is the specific rock plate (ESS) in the forefoot to prevent stone bruising. Outsole keeps XtaRide™ in midsole which allows limited decoupling between fore and rearfoot to better adapt to irregular terrains while aggressive configuration with more prominent lugs as a result of collaboration with renowned tye manufacturer Michelin provide improved grip and traction.